Math isn’t often thought of as a tool for social justice. But mathematical thinking can help us understand what’s going on in society too, says mathematician Eugenia Cheng. For example, abstract math can be used to examine the power structures between men and women, or white and black people, and to more clearly define the relationships and power differentials at play. 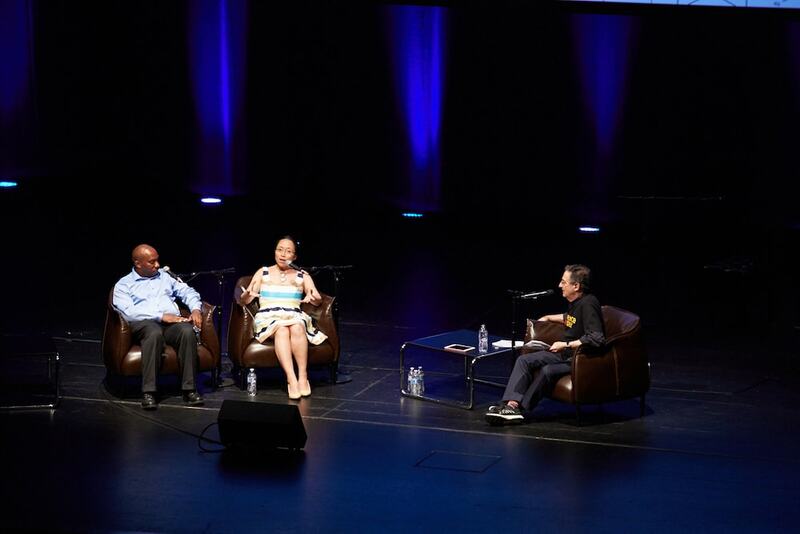 In this conversation recorded live at Chicago’s Harris Theater, Cheng and mathematician Edray Goins talk about math as a liberal art, the myth of the “lone genius” in math, and what logical thinking can reveal about ourselves and our society. Plus, Eugenia Cheng is also an accomplished concert pianist and she played us a few pieces throughout the evening on a Steinway grand piano. In the clip below, she describes a time when mathematical breakthroughs led to musical innovation. On how to apply abstraction to power structures between people in society. Eugenia Cheng: So we can look at the fact that men hold more power in society than women, and we can also look at the fact that white people hold more power than black people—and there’s something analogous about those situations. So we can look at the interactions between men and women and understand something about the power differential and we can kind of transfer between the situations of white people and black people as well. And then we can also understand that then it’s not the same as the relationships the other way round. So that shows us a way in which it’s really different. If a man treats a woman badly, it’s very different from a woman treating a man badly. And likewise if a white person is racist against black people that is different from black people being racist against white people. There is something in common, which is it’s people being bad to people—at that level it’s the same. But there is also some sense in which it is different and we should acknowledge that, that we can then have a different discussion about what we should do about it. But finding those abstractions and connections between things at least gives us a clear starting point for having sensible discussions. On how mathematical biology can be used to predict human behavior. Edray Goins: There’s a branch of math that I’m actually really fascinated about myself. It’s called mathematical biology. It’s not exactly what you might think, which is maybe modeling by how the body works or even modeling how populations might grow and decline over years. Some people are actually using it to model diseases and really model the spread of diseases. But some people have actually gone even further than that and they look to see how you might have certain memes on the internet, how those are spread almost like viruses. So I’ve seen people use some of these really fancy equations of mathematics that might be used for, say, seeing how a rocket engine might go, but using the same equations more or less for some of these social justice ideas. Can you really model how people are going to behave if a certain thing happens? Can you sort of determine how or when a riot might break out? But people are actually using mathematics for actually determining how people are going to behave. On the misconceptions of a mathematician. Edray Goins: I think, unfortunately, mathematics has a tendency to have a stereotype of that there’s somebody who’s not altogether there, is maybe sitting in a room by himself working on problems, you know, halfway going crazy. But really that’s not what mathematics is all about. You know that there’s a lot of people nowadays that are working in large groups—some groups almost act like laboratories. And when I do research with my students, I’d like to have maybe five eight students all kind of working together. Some people are working on different aspects, but eventually we’re all using different techniques to try to solve the same problem. It’s no more about this one solitary person working in a room by himself, but really nowadays math is very very different. Eugenia Cheng: The trouble is there are examples of one solitary person and those tend to make better stories for Hollywood and so they pick up those stories. And if you think about the kinds of mathematicians who are portrayed in popular movies like A Beautiful Mind or The Imitation Game or something, it’s always the same kind of thing: It’s some older white guy who’s a bit strange who can’t make eye contact and he doesn’t like talking to people. On how math can uncover truths about the world. Eugenia Cheng: There’s other math which I think [Goins] and I both are interested in which is not so much about solving specific problems as uncovering truths inside things. The math that tends to get taught in school is more about, “Answer this question! Get this thing right! What’s the answer to that? What? No, you’re wrong! You’re stupid!” And that is not very helpful… whereas if we think of it as getting to the heart of matters and being able to understand the world around us more—not just what’s the answer to this, but in what sense is this an answer and in what sense is this a possible answer. And that to me is what math is really about and why it’s so brilliant and important. Edray Goins is a professor of Mathematics at Pomona College in Pomona, California. IRA FLATOW: This is Science Friday. I’m Ira Flatow coming to you from the Harris Theater in Chicago. Thank you. Now you might think of math as something you do to calculate your wireless bill. Maybe that’s higher math or magic, but my next guests are here to tell you math goes way, way beyond arithmetic. It could be a logical framework for understanding how things in the world are related, or beautiful geometries, and imaginary shapes. New worlds where you can imagine getting from point A to C without ever crossing to point B. Hmm. Math doesn’t need to be intimidating or stressful or something that makes you sweat as you look at the advancing hand of a clock. In fact, maybe it’s time to rethink our relationship to math. And that’s what we’re going to be doing with my next two guests. Let me introduce Edray Goins. He’s professor of mathematics at Pomona College in California. Welcome to Science Friday. Dr. Eugenia Cheng, she’s author of Beyond Infinity and a new work coming out The Art of Logic in an Illogical World. That’s terrific. I want to read that one. And she’s scientist in residence at the School of the Art Institute of Chicago. Welcome. Ed, to kick things off, can you give us a taste of the sorts of mathematical problems that interest you? EDRAY GOINS: I typically like problems that combine different areas of mathematics. I used to like to think about geometry, about symmetry, sometimes real world applications, but really anything that involves as many different tools and aspects as possible. I definitely like to use computers. I also like to combine working with different groups of people, but really just to combine lots of different problems. IRA FLATOW: All right. Let’s look at a slide of an example of the kinds of things that you’re doing. Wow. What is that? EDRAY GOINS: Well, my friends like to call these Christmas wreaths, but that’s not quite what they are. IRA FLATOW: That’s what they look like, a big green sort of Christmas wreathy-looking thing with stuff circling it. EDRAY GOINS: Right. That’s right. In the parlance, we call these [FRENCH]. It’s kind of this fancy French phrase that simply means, “children’s drawings.” I did all of these using a computer program to kind of just graph them, but these are examples of what are called toroidal graphs. They’re graphs where if you try to draw them on a sheet of paper, you have certain dots that we call vertices. And you just try to draw lines to kind of connect the vertices. What this says is, if you try to do it on a sheet of paper, eventually, the lines would have to cross over each other. But here what I’ve done is, instead of drawing them on a flat sheet of paper, I’ve wrapped things around so that they’re on the surface of a torus, if you will, on the surface of a donut. Now, I’m able to draw them so that the lines don’t cross at all. IRA FLATOW: None of those lines? It looks like a donut with a lot of, you know, lines going around it, but none of the lines are crossing. EDRAY GOINS: Right. None of the lines are crossing. You can think of them as all being drawn on the surface of something, but the lines don’t cross at all. IRA FLATOW: So is this a shape that does not exist in nature, or cannot exist? Or can you make it exist? EDRAY GOINS: That’s hard to say. I really haven’t thought much about, say, naturally where a torus or a donut might come up, other than, say, going to something like Dunkin’. But it certainly makes sense that you can try to think of, maybe, places where you might want to have such an application like this. There’s a problem that I often like to give my students. It’s a well-known problem in mathematics where you would have something like, say, three houses, and you would have three utilities. Now, mathematicians fight to keep everything very simple, so we can make this assumption– let’s say everything is just on the surface. So maybe I have three houses here in Chicago. I have three utilities that might be gas, water, and electric. And I’m going to try to connect each of the houses with each of the utilities, but I’m only going to do it, let’s say, on the surface. I’m not going allow it to have power lines that go above. I won’t allow myself to dig holes underneath. But you can try to ask the question, is it possible for me to connect each of the three houses with each of the three utilities such that, let’s say, the gas line doesn’t overlap with the electricity line? What these pictures here show is that you actually cannot do that. You have to go to something fancy like, say, have Chicago to be placed inside of, maybe, like a space station where everything would have to be the inside of a torus, the inside of a donut, and then you can connect everything properly. IRA FLATOW: Wow. Wow. Eugenia, you study category theory. What is that? EUGENIA CHENG: Category theory is sometimes called very abstract mathematics, which means that we’ve got very far away from real life. Abstraction is when you forget some details about a situation so that different situations become the same. And that’s one of the ways that mathematicians make connections between different situations. Just like if I say I have one cookie and one cookie, and that makes two cookies. Or if I have one apple and one apple, that makes two apples. It didn’t matter that they were apples or cookies. We can forget that detail, and we get the abstract situation that 1 plus 1 equals 2. And in fact, at a certain point, math got complicated enough that it needed its own abstraction. And category theory is that for math, at least that’s what I think it is. And so it looks at the structures of math and says, oh, wait, this thing over here kind of reminds me a bit of that thing over there. What if I forget some of the details? They maybe will become the same thing, in some sense. And what is the sense in which that’s the same? And it’s kind of what I find myself doing in life all the time. I think, that piece of music really reminds me of that other piece of music. Why does that happen? Or this person really reminds me of that person. What is it about them? They’re obviously not the same person. But if we can find the thing that reminds us of them, then we can understand more things at the same time, which is really good if you’re lazy like me, because I’m really lazy. Because I’m just too lazy to keep washing dishes. That’s sort of what my field of math is. IRA FLATOW: Well, relate to us how this might work in the real world, the power of abstraction. Give me an example. EUGENIA CHENG: Well, one example is in the issue of power structures between people. And so we can look at the fact that men hold more power in society than women. And we can also look at the fact that white people hold more power than black people. And there’s something analogous about those situations. And so we can look at the interactions between men and women and understand something about the power differential. And we can then use that, and we can kind of transfer between the situations of white people and black people as well. And then we can also understand that then it’s not the same as the relationships the other way around. So that shows us a way in which it’s really different. If a man treats a woman badly, it’s very different from a woman treating a man badly. And likewise, if a white person is racist against black people, that is different from black people being racist against white people. There is something in common, which is it is people being bad to people. So at that level, it’s the same. But there is also some sense in which it is different. And we should acknowledge that. We can then have a different discussion about what we should do about it. But finding those abstractions and connections between things at least gives us a clear starting point for having sensible discussions, I think. IRA FLATOW: It sounds like mathemati– yeah. It’s very rare. I never heard those points made like that. I mean, mathematicians becoming more involved in sociology, perhaps even politics? There are also mathematicians getting involved with some very specific applications of math to the issues of gerrymandering. And that’s more like a specific application to solve a specific problem. But there’s other math, which I think Edray and I both are interested in, which is not so much about solving specific problems as uncovering truths inside things. And the math that tends to get taught in school is more about, answer this question. Get this thing right. What’s the answer to that? No, you’re wrong. [GROWLS] You’re stupid. And that is not very helpful, I think. And I think that you would agree with that. EUGENIA CHENG: Whereas, if we think of it as getting to the heart of matters and being able to understand the world around us more, not just what’s the answer to this, but in what sense is this an answer, and in what sense is this a possible answer, and that to me is what math is really about and why it’s so brilliant and important. EDRAY GOINS: There’s a branch of math that I’m actually really fascinated about myself that’s called mathematical biology. It’s not exactly what you might think, which is maybe modeling about how the body works, or even modeling how populations might grow and climb over the years. Some people are actually using it to model diseases and really model the spread of diseases. But some people have actually gone even further than that, and they’ve looked to see how you might have certain memes on the internet, how those are spread almost like viruses. So I’ve seen people use some of these really fancy equations in mathematics that might be used for, let’s say, seeing how a rocket engine might go, but using the same equations, more or less, for some of these social justice ideas. You know, can you really model how people are going to behave if a certain thing happens? Can you sort of determine how or when a riot might break out? But people are actually using mathematics to actually determine how people are going to behave. IRA FLATOW: Do you think the math is too sequestered in its own little ivory tower? And it maybe can be pulled into liberal arts more, do you think? EUGENIA CHENG: I don’t think it’s an ivory tower. I think it’s a dank dungeon it’s in at the moment. IRA FLATOW: I’ll buy that. I’ll buy it. You know, I see you don’t feel strongly about that. EUGENIA CHENG: I don’t feel strongly at all. No. But that’s why I like giving public talks and writing for people outside universities, because I feel like many people are put off by the experiences of math that they had. And I think that’s really a shame. Because those of us who love math love it for some of the same reasons that people hate it. So everyone hates it because they think it’s about memorizing and about formulae and about getting the right answer. Whereas we love it, probably because– I don’t like to speak for you, but I think maybe you’ll agree that we love it because you don’t have to memorize anything, because it’s all about understanding, and that there isn’t a right answer. There are many possible different worlds in which different things can be true. And so it’s kind of the different sides of the same coin. And I think that– well, we both are at liberal arts places. I’m at the wonderful school of the Art Institute of Chicago where math is taught to art students. I just teach art students. And the School of the Art Institute really believes, as you do, that art and science aren’t really different. And we’ve constructed these contrived boundaries between subjects, I think, for probably bizarre, historical, bureaucratic reasons, probably because of money. It’s usually money. But really, we’re all trying to understand the world better. And there are different ways of doing it, but we shouldn’t just close them off and say, well, this is math, that’s not math. This is art, that’s not art. It’s not productive. EDRAY GOINS: Right. Yeah, I definitely agree with that. Yeah. I think, unfortunately, mathematics has a tendency to have a stereotype of that there’s somebody who’s not altogether there’s, is maybe sitting in a room by himself, working on problems, you know, halfway going crazy. But really, that’s not what mathematics is all about, you know? There’s a lot of people nowadays that are working in large groups. Some groups almost act like laboratories. I know, when I do research with my students, I like to have maybe five, eight students all kind of working together. Some people are working on different aspects. But eventually, we’re all using different techniques to try to solve the same problem. It’s no more about this one solitary person working in a room by himself. But really, nowadays, math is very, very different. EUGENIA CHENG: The trouble is there are examples of one solitary person, and those tend to make better stories for Hollywood. And so they pick up those stories. And if you think about the kinds of mathematicians who are portrayed in popular movies, like A Beautiful Mind, or The Imitation Game, or something, it’s always the same kind of thing. It’s some older white guy who’s a bit strange, who can’t make eye contact, and who doesn’t like talking to people. IRA FLATOW: I thought you were talking about me there for a second. I’m Ira Flatow. This is Science Friday from WNYC Studios. Let’s go here and get some more questions up there on the right side. AUDIENCE: So if you’re working through a math problem with the one cookie plus one cookie, two cookies, and if you don’t know what that would be in another sort of math problem, how exactly would you work that out? EUGENIA CHENG: Oh. Well, we basically make things up. That’s what we do. And the thing is we’re allowed to make anything up, as long as it doesn’t cause a contradiction. So if you cause a contradiction, then your world implodes. And that’s that. But as long as you don’t cause a contradiction, anything is possible. And that, to me, is much more liberating than the world of physics. Because in the world of physics, you’re trying to model the actual world around you. So you can’t just make up anything. You’re trying to do things that happen in the world around you, which I think is very constraining. So for example, in my head, I can do four dimensions, five dimensions, infinite dimensions. In fact, my research has an infinite dimensional category theory. But it’s very hard to do that in real life. So we could say that one cookie plus one cookie is zero cookies, because I ate them. IRA FLATOW: It’s the second time you’ve said that, in mathematics, that there is no right or wrong answer. And you’re shaking your head, yes, Ed, about that. Is that unique in the sciences, that in math, there’s no right or wrong answer? EDRAY GOINS: I probably would say, yes. The reason why I hesitated is there’s a debate amongst most of us in mathematics as to whether math is a science, or maybe more of an art. You know, in science, I think– this is at least the way it is in physics– you really are trying to describe the world that you see. Whereas mathematics, it’s not so much that, you know? You’re kind of inventing things. You’re coming up with your own definitions. Mathematicians play around with very bizarre types of concepts. A lot of times in mathematics, I mean, just like Eugenia said, if you don’t really understand something, you just place a word onto it. You just make it a definition, and then you can spend your entire career simply working with that one definition. Now, it could be that you’re really not getting very far in terms of writing papers or doing things with it. But still, it’s a definition. It’s one that you have. You can do whatever you want with it. Now, math is very strange like that. I mean, you can really invent things. It’s not like you see something in the microscope, and then you’re trying to describe it. No, you can really invent whatever you want. EUGENIA CHENG: I’d just like to say, I’d like to add, that there are wrong answers. If you contradict logic, that is wrong. And so we don’t want to get into the situation that sometimes we get into in the world at the moment where all opinions are equally valid. It’s not that. It’s that as long as you are obeying the rules of logic, then it is a valid piece of mathematics. Whether it’s worthwhile or not is a whole different question. It’s just like if you’re cooking food in your kitchen. There’s no real wrong answer. You might poison yourself, but it’s not exactly wrong. Then there’s just the question of whether it’s delicious and whether anyone else is going to want to eat it. And so with the math as well, you can invent a definition, but then there’s a question of whether anyone else will be interested in it. And so to convince anyone else to be interested, there are various things you can do. You can show that it is useful for something. You can show that it is really beautiful, that it’s so beautiful it’s just compelling, like a piece of art. Art doesn’t have to be useful. It’s beautiful. And so we just derive so much joy from it, maybe that counts as useful. And so those are two of the many ways that we convince people that math is worthwhile. IRA FLATOW: We brought food into this, which is good. What a great discussion. I want to thank both of you– Edray Goins, Professor of Math at the Pomona College in California. Thank you, for taking time to be with us. Eugenia Chang, author of Beyond Infinity and the forthcoming Art of Logic in an Illogical World, and scientist and resident at the School of the Art Institute of Chicago. Thank you. One of our mathematician guests, Dr. Eugenia Cheng, will also be playing a few pieces on the piano for us. And for her first performance, she’s going to tell us about the connection between math and music. Let’s invite her up to the stage. Dr. Chang, a scientist in residence at the School of the Art Institute of Chicago. Come on up. EUGENIA CHENG: Hello. It’s so wonderful to be here on this amazing stage where I’ve seen so many great concerts in the past. And I’m going to talk to you about one of my favorite things, which is the connection between math and– anything, really. That’s my favorite thing. And music is another of my favorite things. So of course, the connection between math and music is one of my favorite things. There are so many things I could talk about, I just have to pick one little one. And it’s going to be about things that are amazing in ways we maybe don’t notice, until we think about it a bit harder. And that’s one of the things I love about thinking harder– we see how amazing things are. And sometimes, we think, say, the square root of 2, that’s just a number. But it’s a really amazing number. And it took mathematicians thousands of years to figure out what the square root of 2 is. It’s just a number such that, when you multiply it by itself, it’s 2. But you may know it’s an irrational number, so that means it’s a decimal number that goes on forever and ever without repeating itself. What has that got to do with music? Well I’m going to play one of my favorite pieces of Bach from the 48 preludes and fugues that Bach wrote. Bach had tons of math in his music. And one of the things that happened was he got so excited about being able to write in every key that he wrote a piece in every key. So there are 12 notes on the piano keyboard. 12. And so he wrote 12 keys. Then there’s major and minor. That makes 24. And then he got really excited and did it all again, so that makes 48. But why was he so excited? It’s because before his time, it wasn’t possible to write music in every key. Because when you tuned a keyboard instrument– it wasn’t pianos in those days– but when you tuned a keyboard instrument, some keys would sound great, and the other keys would sound terrible. If you go up an octave, what you’ve done is you’ve multiplied the frequency by two. So in order to get 12 equal intervals into your octave, you have to divide that octave into 12. But you don’t just divide the interval by 12 in numbers. Because when you multiply a frequency, that’s when you get an interval. So you multiply it by two to get the octave, which means you need to multiply by a number such that, if you multiply 12 times, you get two. That means we’re looking for the 12th root of 2, a number such that when you multiply it by itself 12 times, you get 2. That’s a really difficult problem. And mathematicians spent thousands of years– and it’s an irrational number– they spend ages. They couldn’t do it, so they had to try and fudge it with fractions and things, which meant, typically, the C or the G would sound nice. And then maybe also F would sound nice. So you get lots of pieces that just use those chords. And then maybe also this one. But ultimately, that’s a bit limited and limiting. But then in Bach’s time, they figured out a way of doing it, not quite with the 12th root of 2, but so that it was more or less OK to write in every key. And I feel like I can sense Bach’s excitement as he goes through the keys in these pieces. But it’s amazing. He’s never been able to write in this key before. And so I’m going to play a prelude an F sharp. Now, F sharp is exactly halfway between C and C. That means it’s actually the square root of 2 away. So the frequency ratio is the square root of 2, which is why it’s related to the square root of 2. This interval is the least consonant interval. It’s the most dissonant. It used to be called the devil in music, because it is the one that sounds– the harmonics interfere with each other the most. And I feel like I’m just sensing Bach’s wonder that he can actually write a piece in F sharp for the first time. And so the piece is quite simple. Some of the pieces that are in more standard keys, like C minor or G minor, are really complicated. And I feel like it’s because he’s used to writing in those keys. Whereas this one, he’s never been to before, so he just sits there and goes, this is amazing. Just like if you go to a beautiful beach for the first time. You don’t do anything, you just stare at it and you go, this is beautiful. Then he wanders around different keys feeling how beautiful it is to be able to go in these keys he’s never been to before. And he doesn’t stay in any of them for very long. And then he comes back to F sharp. And I just feel like it’s almost childlike wonder. It’s not a complicated piece, but it’s in F sharp, which is the square root of 2. Can We Predict Urban Gun Homicides? Thousands of people of color die every year from gun homicides in cities. Can social science predict and prevent their deaths?